Well, - not quite, but we had a good go at The Time Warp and the Row boat song... providing a lot of entertainment for the club locals, bar man and the K1 fleet that join us for the weekend open at Tewksbury. DJ cool (Aka Simon Hill) and his able assistant (Meg), chose a great selection of songs to see us through the Saturday evening BBQ. Bar man Matt seem to enjoy the event and joined in on his broom. 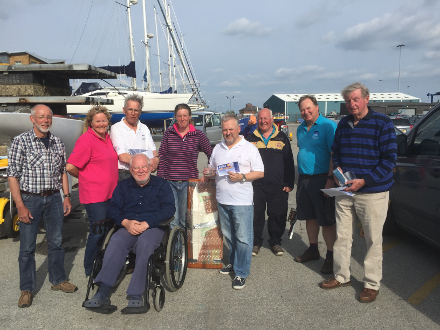 The 2016 International Paint Poole Regatta was held over the Spring Holiday weekend 28th - 30th May and during this at the Poole Yacht Club we held our National Championship. 1st place and 2016 National Champion was Iain Stowe. Just in case anyone is confused, where Iain is shown as 2.4mR winner on the Regatta website, the Mrs Robinson he is shown as winning with is his boat, not a crew! 2nd was Martin Whittingham-Jones and 3rd was Simon Hill. Special mention must go to Jean-Paul Alexander from the Royal Yacht Club van België who joined us. 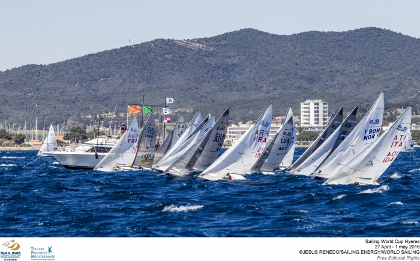 From the 25th April to the 1st May the ISAF Sailing World Cup was held in Hyères, France. In the 2.4mR competition Matt Bugg took first place. With Bjørnar Erikstad 2nd and Damien Seguin 3rd. Full results are here. CONGRATULATIONS MEGAN - FIRST BRITISH 2.4mR WORLD CHAMPION !!! The International 2.4mR World Championships 2016 was held in Hobart, Tasmania from January 6th to 10th and we are pleased to announce that the new World Champion is the UK 2.4mR Association Chairman - Megan Pascoe. Megan Pascoe presented with her trophies by the Commodore of the Royal Yacht Club of Tasmania Matthew Johnston.